It’s about time we updated our post about connecting Tableau and Google Analytics via Google Sheets. Tableau announced a new native connector to Google Sheets in 2016, and it’s just as simple as the other native connectors in Tableau. Upgrade to Tableau 10, if you haven’t already, and follow the Google Sheets connector steps here! The best news isn’t that you save so many steps in the initial setup – that was a one-time effort, anyway. 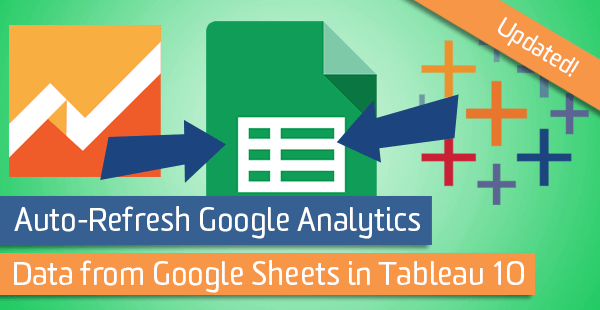 What really counts is that you can now auto-refresh your Google Sheets data in workbooks uploaded to Tableau Online. I had already scheduled all my Google Sheets to auto-refresh via the Google Analytics Add-on. 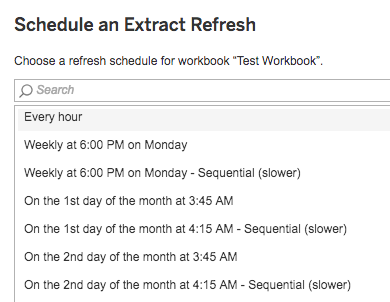 Now I can update previously-uploaded reports by scheduling a refresh in Tableau Online to occur an hour later. Awesome! For auto-refreshes, the key difference between the old “Web Data Connector” and the new native connector to Google Sheets is that the native connector lets you embed your credentials. Previously, Tableau Online would not let me save my credentials with any workbooks I uploaded. Oh, it offered to save them, but it didn’t know what to do with them and the refreshes always failed. Now with the native Sheets connector, my credentials are embedded successfully and my scheduled refreshes can proceed. I upload once to Tableau Online, schedule the refresh, and I’m done! Another difference is that when my data sources used the old Web Data Connector, Tableau always forced me to create data extracts before uploading to Tableau Online – it wouldn’t let me upload a workbook with live data sources based in Google Sheets. The native connector lets me keep live data sources if I choose. Usually I prefer to use extracts instead of live data in Tableau, but it’s nice to have the option. I began using the Web Data Connector because of the limitations of Tableau’s native GA connector. I put up with manually updating about a dozen web data sources per workbook, because it was better than creating and maintaining several hundred native GA connectors. No more manual updating for me! I’ve converted my old Web Data Connectors to Google Sheets connectors, and my scheduled refreshes are all set in Tableau Online. One final note: Consider using Google Data Studio! Data Studio may be a good alternative for Analytics 360 customers who are seeing sampled GA data when querying the Reporting API, especially if other options for reducing sampling in Tableau are off the table. Unlike all other reporting tools outside GA, which have to rely on the Reporting API, Data Studio connects directly to the tables in your Google Analytics reports. For a hands-on workshop, check out our new Google Data Studio training!